Samsung is expected to launch the Galaxy S10 and its first foldable smartphone early next year. However, there wasn’t any official confirmation until now that which SoC (system on chip) will be powering the upcoming Galaxy S10 device. Now Samsung seems to be revealing its new SoC for its upcoming Galaxy devices including the Galaxy S10. 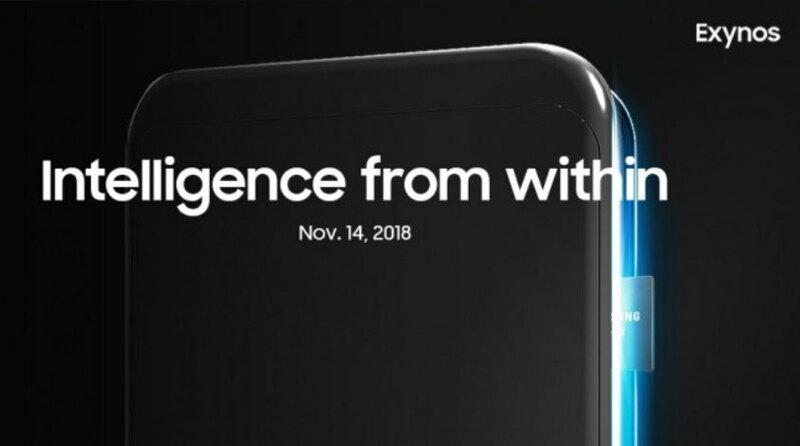 Samsung today via its official Twitter account announced that it will launch its new and the most powerful processor on November 14, which is widely expected to be called as Exynos 9820. According to the earlier reports and rumours, the new Samsung Exynos processor will be manufactured by Samsung’s 7nm EUV process. The SoC will consume 50% less power and provide a 20% more performance to the device than its predecessors. The new Exynos 9820 SoC as its biggest highlight will come with the 5G network support using Samsung’s recently announced Exynos 5100 Modem. Samsung at its recent “2018 Samsung OLED Forum” conference at Shenzhen Marriott Hotel in China, Samsung showcased its various under-Display technology for its upcoming devices including the Galaxy S10. The technology will not only allow Samsung to integrate the fingerprint sensor under the display but it will allow Samsung to place the front cameras and other sensors under the phone’s display.